Every week we pull together some great Canadian recipes from Canadian food bloggers around the web featuring one main ingredient or dish. This week we're sharing over 3o strawberry recipes! Warmer weather and strawberries are a match made in heaven. The sweet-sourness of the fruit is what our taste buds crave for when it's hot outside. Strawberries also have the quality of pairing perfectly with a wide variety of foods and ingredients, from sugary pastries to boozy cocktails or refreshing sorbets. Very few things beat a scrumptious strawberry shortcake or muffin or milkshake, however, we believe it is time to mix things up and get berry creative. Strawberry soup? Yup, that's a thing! Shrub for mocktails? We've got it! Buns with strawberry glaze? Just keep reading and you'll find these recipes and more! These [Vegan Strawberry Mousse Tarts](https://thestingyvegan.com/vegan-strawberry-mousse-tarts/) are airy, light and full of strawberry flavour! 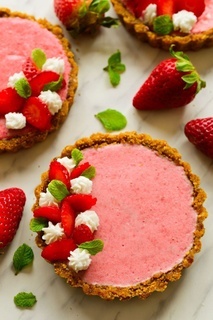 Made with fabulous aquafaba for a real mousse texture with loads of air bubbles, fresh strawberries and a simple two-ingredient crust, this vegan tart is the perfect spring dessert! From **The Stingy Vegan**. These buttery [Hazelnut Shortbread Cookies](http://foodnouveau.com/recipes/desserts/cookies/hazelnut-shortbread-cookies/) are filled with a bright Roasted Strawberry Buttercream that wonderfully showcases summer's bounty. From **Food Nouveau**. To celebrate the summer solstice, head to your farmer's market, get some strawberries and rhubarb and celebrate with this decadent tasting [Strawberry Rhubarb Frosty Mocktail](https://www.meghantelpner.com/blog/strawberry-rhubarb-frosty-mocktail/). From **Meghan Telpner**. This [Spiced Strawberry Watermelon Gazpacho](https://justinecelina.com/spiced-strawberry-watermelon-gazpacho/) is the perfect menu addition for your next spring soirée, baby or bridal shower, or anytime you’re hosting your girlfriends and want something fuss-free, fresh and festive! From** Justine Celina**. These [No-bake Strawberry Lemon Cheesecake Jars](https://satoridesignforliving.com/no-bake-strawberry-lemon-cheesecake-jars/) are an easy and totally scrumptious dessert. Whip up a batch for your next family get-together or dinner party. Yum! From **Satori Design for Living**. These [Vegan Chocolate Rolls with Strawberry Cream Cheese Frosting](http://www.radiantrachels.com/chocolate-rolls-strawberry-cream-cheese-frosting/) were created as an act of self-love and are the perfect food for the soul! From **Radiant Rachels**. This [Strawberry Honey Hibiscus Shrub](https://sweetlizzy.ca/strawberry-honey-hibiscus-shrub/) is a tangy and sweet syrup to add to soda water for the perfect summer mocktail or cocktail! From **Sweet Lizzy**. It doesn't matter if the weather isn't what you're expecting yet, this refreshing [Strawberry Sangria](http://www.compelledtocook.com/project/strawberry-sangria/) begs to be sipped in the sun with your favourite pals! From **Compelled to Cook**. Full of flavour and richness, this [Fresh Fruit Tart](https://www.slicedginger.com/home/fresh-fruit-tart) will remind you of a classic strawberry shortcake, except that this version is packed full of nutrients. From **Sliced Ginger**. This [Strawberry Zinfandel Sorbet with Chocolate Magic Shell](https://www.isugarcoatit.com/2014/08/strawberry-zinfandel-sorbet-frozenfriday14.html/) is a berry cool, boozy sorbet that's going to make you drool as soon as you see the dripping dark chocolate mixing with the refreshing sorbet. From **I Sugar Coat It**. Click on the photos to go to the recipes. A big thank you to all our FBC Members who participated in this weekend's Strawberry Recipes roundup.